My father’s 70th birthday was Tuesday, March 3, 2009. My husband and I had plans to take him out to dinner to celebrate. Instead, we rushed our seven week old son, Andy, to the hospital, where he was admitted in respiratory failure. My father spent his birthday with us at in the pediatric intensive care unit at the hospital, desperately praying for Andy to survive the night and helping me get through it. In the days following, Dad researched every possible scenario facing our boy, peppering Andy’s doctors with questions about botulism and providing me with reams of printed research. When Andy’s diagnosis of SMA was made official, Dad was there with ideas for proactive treatments, hoping to help us get ahead of Andy’s quickly progressing symptoms. He and my mom brought us dinners, so we didn’t have to worry about cooking. They cleaned our house, and Dad mowed the lawn. After I had to leave my job, Dad even helped us pay the bills. My father always there so support us – mostly in quiet, unobtrusive ways – so we could focus solely on caring for our son. During Andy’s many hospitalizations, Dad was a calming force in an often chaotic environment. When doctors wouldn’t listen to me, Dad took over trying to convince them to follow SMA protocol. He was – and still is – our greatest advocate. In fact, I think that Andy inherited his quiet strength from his grandpa. When I looked at my newborn son, I saw my father looking back at me. Same eyes, same cheeks. They even shared a name; Andy’s middle name – Glenn – is my dad’s. In a life spent trying to make my dad proud, Andy’s birth was my greatest achievement. When I watched my father hold my son, I was filled with profound joy. I finally understood what it meant to be a parent and realized the true depth of my parents’ love for me. 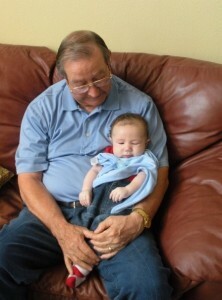 And, Andy adored his grandpa too. Andy was in my dad’s arms when he lifted his head for the first – and only – time. 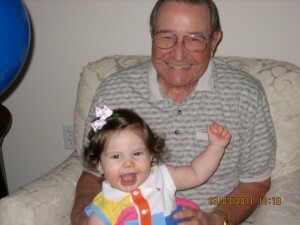 When he was 12 weeks old, Andy lifted toys to my dad, even though he had very little strength left in his arms. But, Grandpa had asked him for those toys, and, like me before him, Andy would do whatever he could to make him proud. Dad was there on the day that Andy was born, and he also was there on the day that Andy died, just 20 weeks later. I know that Andy’s passing devastated my dad, but I will always appreciate how strong he was for me. Dad dealt with the funeral home when I couldn’t. He still organizes the flowers that grace the headstone on Andy’s final resting place. And, while I understand how hard it must have been to see me suffer through such great pain, he gave me the space to grieve. Again, Dad supported me in any way he could – sometimes he listened as I ranted, sometimes he helped solve a problem that I couldn’t handle, sometimes he just comforted me as I cried. And, Dad was there on the day almost two years ago when Andy’s little sister, Lucy, was born. She loves her “Papa” and has him wrapped around her little finger. She lifts her arms to him to pick her up, and I see the love shining in his eyes. She snuggles against him in his big chair as he reads to her, and I can feel the happiness radiate from him. She leans over to give Papa a kiss, and I know his heart is being healed – just as mine is too. 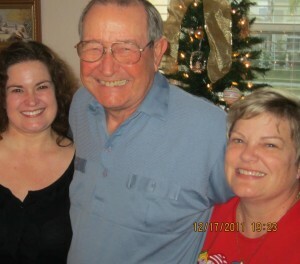 Today, Dad celebrates his 73rd birthday, and, tonight, we are finally taking him out to dinner. We won’t buy him lots of presents, because there’s nothing he wants. We are happy again. Our family is strong. Andy, while he can’t see him, is with us always. Lucy is smart, beautiful, and thriving. We’ve made my dad proud. What else is there? Audra and Alan have been forced to look the devil in the eye. They did not flinch, rather they found the strength deep within themselves to overcome the overwhelming grief of losing a child and it’s aftermath. There are no words sufficient to express how proud I am of them. They greatly surpassed my expectations. You are both “giants” among humanity. You will always have my love and respect. Your words have touched us both and we are crying, but they are good tears, happy tears, healing tears. This is such a beautiful tribute to a very wonderful man – he deserves it. We are all blessed. So touching and so richly deserved — to a most wonderful man — the ultimate CLASS ACT!